Le Pen, unveils his book as he faces possible humiliation next week when the National Front party, votes on scrapping his post of honorary president. 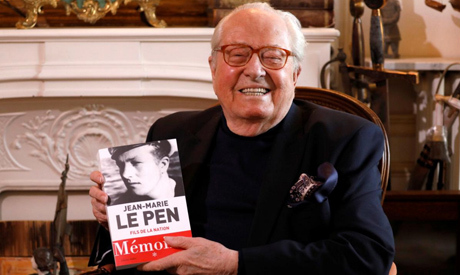 The memoirs of France's former far-right leader Jean-Marie Le Pen, due to hit bookstores this week, have already sold out, his publisher said Tuesday while announcing a new print run to cope with demand. Readers have reserved 50,000 copies of the first volume of Le Pen's autobiography, which charts the political beginnings of the provocative leader and convicted Holocaust denier, according to the Muller publishing house. "We did not know how the book would be received by booksellers but it's going rather well," Muller's boss Guillaume de Thieulloy said. Le Pen, 89, unveils his book as he faces possible humiliation next week when the National Front party, which he co-founded and led for nearly 40 years, votes on scrapping his post of honorary president. The vote marks the climax of a bitter public feud between Le Pen and his daughter, current FN leader Marine Le Pen, who had him booted out of the party in 2015 for repeatedly calling the Nazi gas chambers "a detail of history". Jean-Marie Le Pen touches on the row in his book, "Fils de la Nation" (Son of the Nation), extracts of which were published last week by French media. "I pity her", he is quoted as saying of his daughter, who was runner-up to Emmanuel Macron in France's presidential election last year. Also in his book, Le Pen ardently defends France's collaborationist wartime leader Philippe Petain in his book, saying he did not dishonour himself by signing the 1940 armistice that allowed Nazi forces to occupy northern France. Under Petain, the Vichy regime put to death up to 15,000 people and helped deport nearly 80,000, including large numbers of Jews. But the wrath of Le Pen -- who has a string of convictions for anti-Semitism and Holocaust denial -- is reserved for war hero General Charles de Gaulle, whom he accuses of "helping make France small" by granting Algeria independence in 1962. A former paratrooper, Le Pen caused a political earthquake in 2002 when he made it to the second round of the presidential election, which he went on to lose to Jacques Chirac. But his influence has waned since his daughter took over the FN leadership. Lorrain de Saint Affrique, one of his advisors, said he was "very happy" about the success of the book. "It shows how interested the French are in history and the extent to which Jean-Marie Le Pen has been present in French political life, whether for good or bad," he told AFP. Le Pen has fought tooth-and-nail to maintain his links to the National Front, with a court ruling this month that even though his party membership had been cancelled, he should be allowed to remain on as honorary president. But the party has come up with a workaround: at a conference next week it will vote to simply scrap the role.